Following the recent birth of our first niece, our thoughts naturally turned to nursery wares. 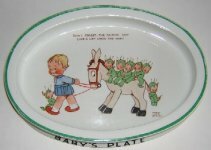 Ostensibly designed for children but chosen and purchased by adults, early nursery ware designs often reflected what parents would like their children to be thinking about more than anything else. 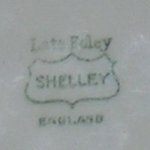 Decorative nursery wares seemed to peak in popularity around the beginning of the 20th century, and one company to that find considerable success in the market was Foley-based Shelley China. 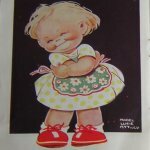 Although they are best-known today for their highly-collectable Mabel Lucie Attwell-designed Boo-Boo nursery wares and figures, Shelley actually produced a much wider range of nursery wares than you might expect. 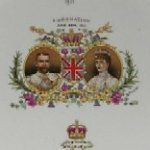 The earliest pieces had a decidedly Victorian moral tone and were introduced in 1896. Featuring fairly conservative designs that had often been licensed from other publications, they tended to include slogans such as "Be Prepared" and "Conscience". 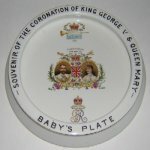 Limited editions such as this 1911 Coronation Baby Plate were also made - but could hardly have been expected to appeal to their end users. Although of some interest to collectors, values for these pieces are relatively modest - of far greater interest are the later designs by Hilda Cowham and Mabel Lucie Attwell, which were made from around 1925 until the 1950s. 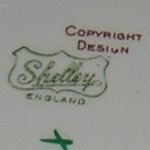 Both designers were well-known in their own right and brought highly-distinctive and original designs to Shelley, who in turn produced a wide range of shapes for them. These included miniature tea sets, night lights and figures - as well as the more obvious baby plates, dishes and cups and mugs. 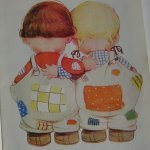 Most of Mabel Lucie Attwell's work formed part of the Boo-Boo range - a wide selection of nursery wares and figures featuring a young girl and boy, who interact with innumerable green-clothed elves, donkeys and other animals. Fairies and other such creatures were very popular with adults in the 1920s (e.g. Wedgwood's Fairyland lustre range) and Mabel Lucie Attwell's fairies, as the elves are described, are a colourful and rich reminder of the innocent fascination young people also had for such stories. 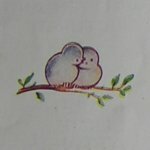 Each illustration is usually accompanied by a verse, and unlike Shelley's earliest nursery wares, these add to the story and will undoubtedly have appealed to the children of their time as well as their parents.